ADA, Okla. – For the first time since the 1993 campaign, the East Central University football team will play past the regular-season schedule, as they have accepted a bid to play in the 2014 C.H.A.M.P.S. Heart of Texas Bowl. The Tigers will face Texas A&M Commerce, Saturday, Dec. 6 at 6 p.m. at Bulldawg Stadium in Copperas Cove, Texas. The bowl game is not only the first in the NCAA era for ECU, who finished the regular season with a 6-4 record in the Great American Conference, but it is the first bowl game since the 1975 season when the Tigers faced Henderson State in the Bicentennial Bowl. More information, including how to purchase tickets will be available later at www.ecutigers.com. 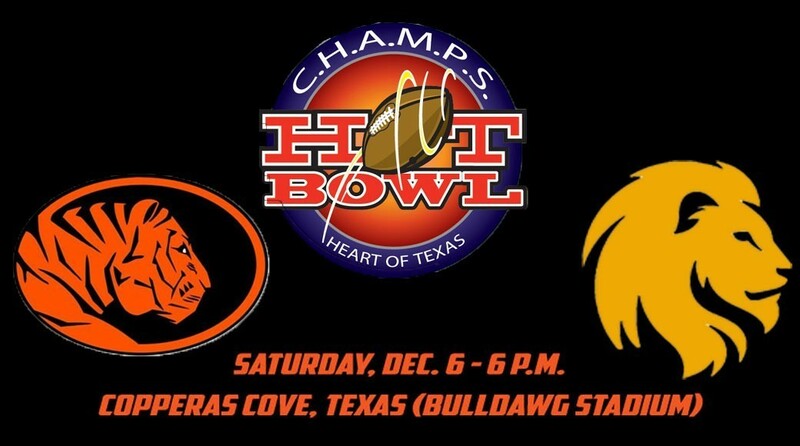 The Heart of Texas Bowl, which has existed for 13 years as a junior college game and added a Division II game in 2012, will be a doubleheader featuring the JUCO game in the afternoon followed by a Lone Star Conference team taking on a Division II opponent in the night cap. The bowl is sponsored by C.H.A.M.P.S., Communities Helping Americans Mature Progress and Succeed, a school-based program aimed at educating students about the dangers of the abuse of illicit drugs and alcohol, and was founded by Copperas Cove Head Coach and Athletic Director Jack Welch.